A unique formulation that instantly cleans & shines ALL nonporous surfaces including: Plastic, Acrylic, Plexiglas, Lexan, Mylar, Polycarbonate, Carbon Fiber, Aluminum, Chrome, Clear coats, Fiberglass, Gel coats, Glass, Stainless Steel Repels dust while helping to protect from fingerprints & scratches Alcohol Free Ammonia Free Antistatic Nonflammable Water, based Not recommended on fabric or suede leather DO NOT use on vehicle controls such as steering wheels, handlebars, throttles, brake/gas pedals, motorcycle/personal watercraft seats, and surfaces critical to safe operation Directions: SHAKE WELL For small areas or electronics, wipe directly onto cloth, lightly covering area For best results, use a clean, dry microfiber cloth Wipe Rolite Plastic & Acrylic Cleaner until residue is removed Turn cloth over to a dry area and lightly buff the surface until all residue disappears Causes slippery surfaces which should be wiped until dry. 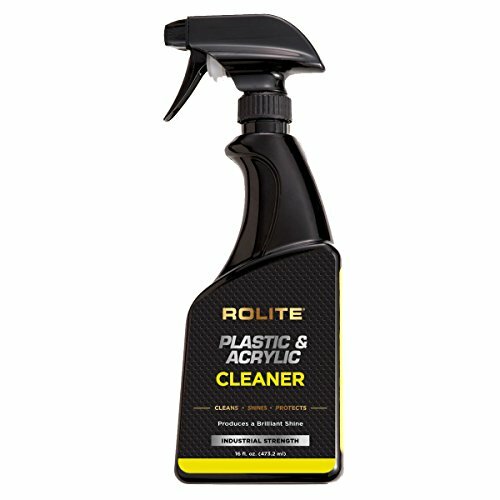 Cleans, Shines and Protects – unique formulation that instantly cleans & shines ALL non-porous surfaces including: Plastic, Acrylic, Plexiglas®, Lexan®, Mylar®, Polycarbonate, Carbon Fiber, Aluminum, Chrome, Clear coats, Fiberglass, Gel coats, Glass, Stainless Steel and much more. Repels dust while helping to protect from fingerprints and scratches. Environmentally friendly. Alcohol Free. Ammonia Free. Anti-Static. Non-Streak. Non-Flammable. Water-based. Great for use on: 3D Printers, Aquariums, Arena Shields, Automotive, Aviation, Cameras, Cash Registers, Copiers, Collectible Displays, Countertops (Polished), Framed Pictures, Glass Windows/Mirrors, Headlight Lenses, Helmets/Visors, Hot Tubs/Spas, Marine, Monitors, Motorcycles, Museums, RV Interiors & Exteriors, Store Displays, Stove Tops, Trade Show Exhibits, TV Screens/LCD & Plasma Not recommended on fabric or suede leather. DO NOT use on vehicle controls such as steering wheels, handlebars, throttles, brake/gas pedals, motorcycle/personal watercraft seats, and surfaces critical to safe operation. Directions: SHAKE WELL. For small areas or electronics, wipe directly onto cloth, lightly covering area. For best results, use a clean, dry microfiber cloth. 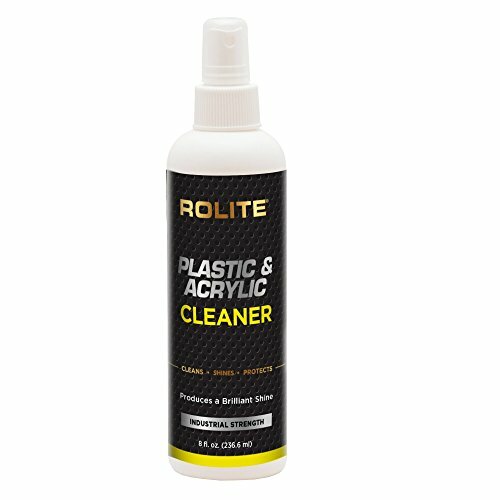 Wipe Rolite Plastic & Acrylic Cleaner until residue is removed. Turn cloth over to a dry area and lightly buff the surface until all residue disappears. Causes slippery surfaces which should be wiped until dry. Cleans, Shines and Protects – unique formulation that instantly cleans & shines ALL non-porous surfaces leaving a smooth, shiny surface. Great for: Plastic, Acrylic, Plexiglas®, Lexan®, Mylar®, Polycarbonate, Carbon Fiber, Aluminum, Chrome, Clear coats, Fiberglass, Gel coats, Glass, Stainless Steel and much more. Repels dust and protects from fingerprints and scratches. Ammonia and Alcohol Free. Anti-Static. Streak Free. Non-Flammable. Water-based. Great for Sporting Goods, Automotive, Boats, Eisenglass, RVs, Museums, Motorcycles, Trade Show Exhibits, Windows/Mirrors, Countertops (polished), Copiers, Collectible Displays, Arena Shields, 3D Printers, Aquariums and many more. Made in USA. High performance product preferred by professionals.